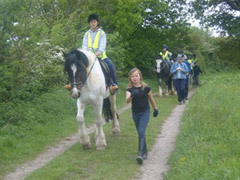 Whether you are learning to ride at a riding school, or an adult who has been out of the saddle for some time, or a complete beginner looking for a one off pony trekking experience, mini-trekking is for you! Children from the age of 4 years, and adults, have the opportunity to enjoy horse and pony trekking under the guidance and supervision of experienced 'leaders' who accompany you on foot. This is a very popular family activity and a great treat for a children's birthday party or a group of friends. The 1 hour trek follows the bridleway across fields to the village of Marston and turns back just before the entrance to Kingsbury Water Park. 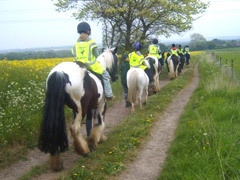 The leaders are with you to ensure that you are safe and they are happy to provide you with information and instruction to help you feel confident on the horse or pony. All riders are fitted with a body protector and a hard hat. 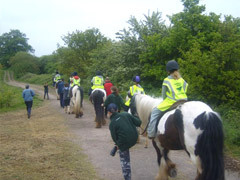 Horse and pony trekking is a great way to get out into the countryside and a fantastic introduction to horse riding. 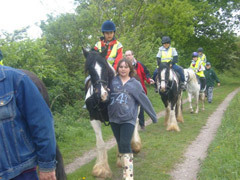 We also offer mini trekking to the canal, suitable for disabled riders which lasts half an hour.